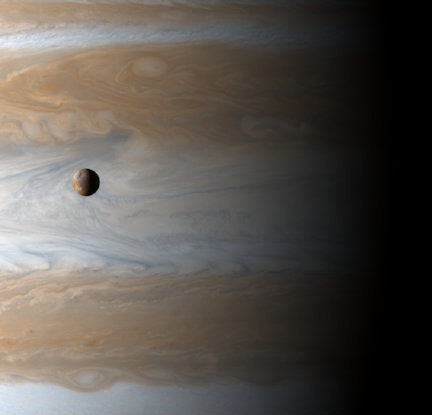 Jupiter has been known since very ancient times, so how did Jupiter get its name? While it had many names throughout history, the Roman empire had the greatest influence over a wide portion of modern society, so the names accorded to planets by the Romans still hold sway over astronomy. The Romans named the planet after their king of gods, Jupiter, who was also the god of the sky and of thunder. Why choose to name the planet Jupiter? It was the largest object in the sky; therefore the most powerful; therefore Jupiter. In the Roman pantheon, Jupiter began as the sky god, concerned mainly with wine festivals and associated with the sacred oak of the Capitol. Eventually, he was attributed the spoils of war and became a god of war. It was believed that he caused the armies to stand strong and be victorious. He was the main witness in all oaths. Jupiter was the central god in the Capitoline Triad along with Juno and Minerva. He remained Rome’s chief official deity throughout the Republican and Imperial eras, until the pagan system was replaced by Christianity. Jupiter granted Rome supremacy because he was ”the fount of the auspices upon which the relationship of the city with the gods rested”. He personified the divine authority of Rome’s highest offices, internal organization, and external relations: his image in the Republican and Imperial Capitol bore regalia associated with Rome’s ancient kings and the highest consular and Imperial honors. Roman consuls swore their oath of office in Jupiter’s name. To thank him for his help, and to secure his continued support, they offered him a white, castrated ox with gilded horns. It is common practice for a planet, moon, and many other celestial bodies to get their names from Greek or Roman mythology as well as derive their astronomical symbol from that particular personality. Some examples are Neptune the God of the Sea, Mars the God of War, Mercury the Messenger, Saturn the God of Time and father of Jupiter, Uranus the father of Saturn, Venus the Goddess of Love, and Earth, well, Earth is the only planet to buck the Greco-Roman tradition. The answer to how did Jupiter get its name is very simple. If you delve into the planet much deeper, you will find that the planet itself is a mystery that scientists are still trying to unravel. We have written many articles about Jupiter for Universe Today. Here’s an article about how long it takes to get to Jupiter, and here’s an article about the temperature of Jupiter. where did the palnet came from?? Next PostNext What is Jupiter Made Of?